A family in Poway escaped after their home burst into flames in Poway Sunday morning. 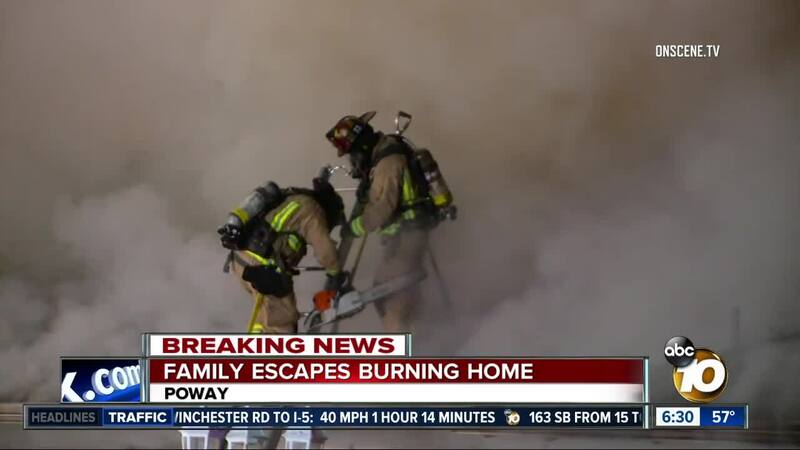 POWAY, Calif. (KGTV) -- A family in Poway escaped after their home burst into flames in Poway Sunday morning. The fire started at a home on the 17000 block of St. Andrews Drive around 3 a.m. According to firefighters, crews were able to extinguish the flames in most of the attic, but the home was a total loss. A man inside the home at the time of the fire says he and his adult son woke up to the smoke alarms going off. "I never thought that things would happen this quickly in a fire that I was involved with in the house. I though well, I'll have time to get stuff out. It going to be in one part of the house. But this thing was like, you couldn't go in any part of the house after we were aware of it for a minute or two,” said homeowner Greg Heer. Heer said they were able to get their two dogs out of the home, but the flames were too intense to return and rescue several kittens. A board and care home next door had to be evacuated as crews battled the flame. Firefighters say it’s still unclear what caused the fire.